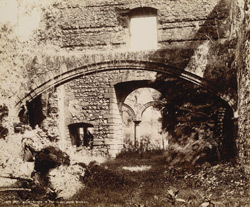 Photograph of the great archway in the Fransiscan Church at Bassein, Thana District of Maharashtra, taken by Henry Cousens for the Archaeological Survey of India Collections: Western India 1897-98. This view shows the interior of a ruined church, with shallow arch spanning in the foreground. Bassein, situated 45 km north of Bombay, is an old fortified Portuguese city which prospered from 1534 to 1739. During this period the town was inhabited by Portuguese nobles who built many churches, convents and houses.